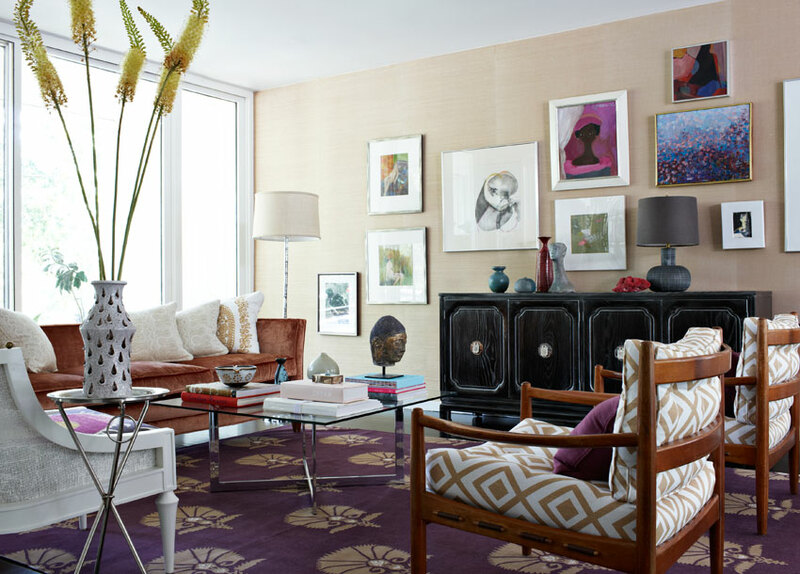 I just came across Angie Hranowsky, Graphic and Interior designer. I know she has been discovered years ago and I’m a little late but I’m happy I’m here. She is everything I aspire to be, I love all of her interiors. Angie lives in Charleston, South Carolina where she spotted an open layout house for sale and turned it into this gorgeous space. This is the living room. 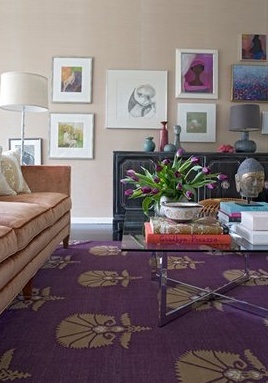 So beautiful, the color palette is perfect with the neutral warm colors mixed in with purples. 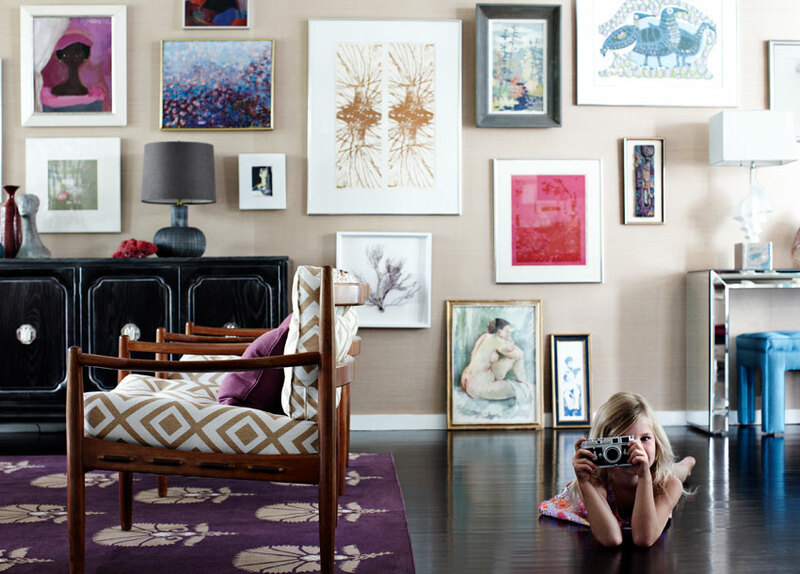 Angie put in a gallery wall that goes all the way from the living area to the dining area. It’s a collection of art from all her years. I absolutely love how this is done. The home has a really cozy feeling, I think choosing a zebra hide that is brown and white instead of black and white was a good decision for warmth. Look at the details of the living room, everything feels so effortless. The way the tulips fall is beautiful in a very natural way. This den has a great mix of warmth and retro. The geometric room divider is strong and simple and the curves in the den balance beautifully. I love this den, I want this den. Just when I thought it couldn’t get any better I see this kitchen. I mean I’m in love. 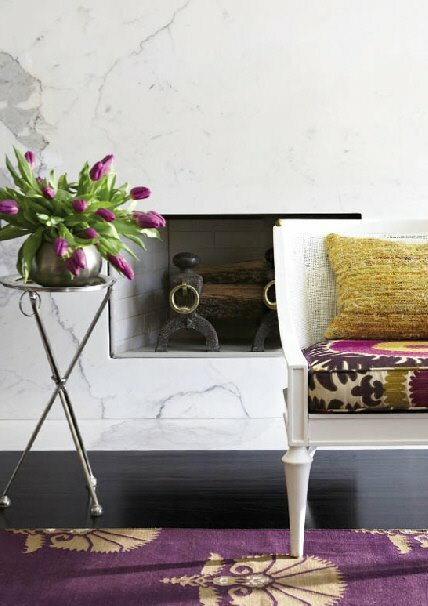 Those lucite bar stools from the 70s are killing me. 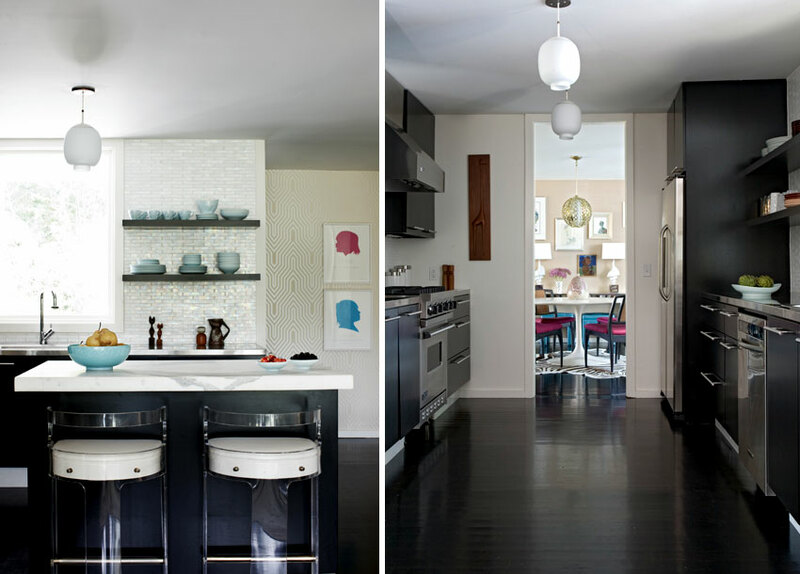 Love those floating shelves over Ann Sacks tile. That’s a great use of a small wall space. Those two pictures in her kitchen are silhouettes of her two children- I know so cute. Yes somebody sleeps here and it’s not you; it’s Angie. Glamorous canopy bed, great Suzani blanket and perfect color combination. And this is her entry way. She probably can’t keep people from coming in with a view like this. Her style is effortless, relaxed and modern. The pieces from one room to the next all connect with each other and tell a story. Love this home, Love her work.